For a number of years Lotus Rock has had in its handle range high quality, stylish and durable handles that are safe for oven use. Up till now, these type of handles have all been in the Professional & Forge collection. However, the highly technical and well-trained R&D team at Lotus Rock have developed a new type of handle, called Ruhr, as shown below, which is made of cast iron material. This type of handle very much compliments a Lotus Rock pan because it shares many of its traits: heavy, scratch and abrasion resistant, for long term use. 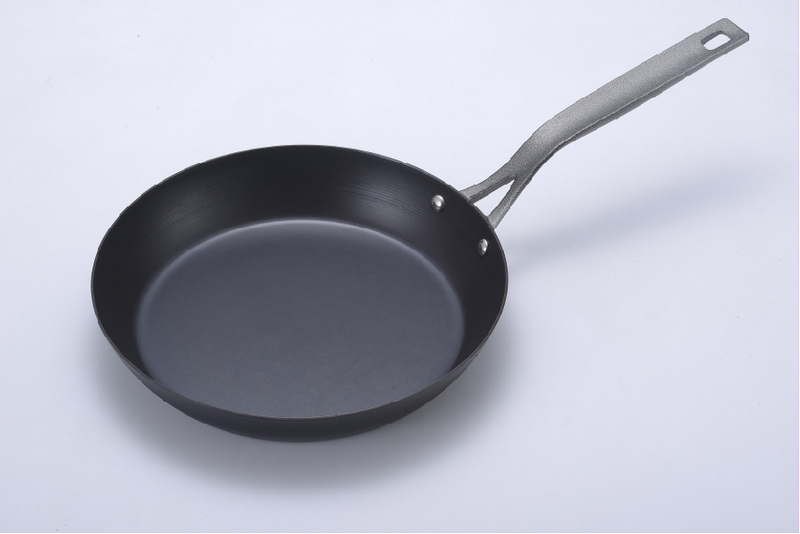 A cast iron handle cannot be used with a general non-stick aluminum pan because it is too heavy; likewise it is not very suitable for stainless steel pans on aesthetic grounds. But, as you can see in the photos below, the Ruhr handle matches with a Lotus Rock pan perfectly. It has an ergonomic design for easy handling, and because there is an open space within the handle next to the pan, the Ruhr handle does not get that hot during use. Lotus Rock is a professional chef’s favourite (celebrity chefs in USA, UK and elsewhere use it under their own branding), and an oven safe handle, such as Ruhr, is essential for use in a restaurant kitchen. With a frying pan, it is especially so because it is constantly being moved back and forth from the stove and oven.